The latest impact footprint released by the International Asteroid Warning Network (IAWN). 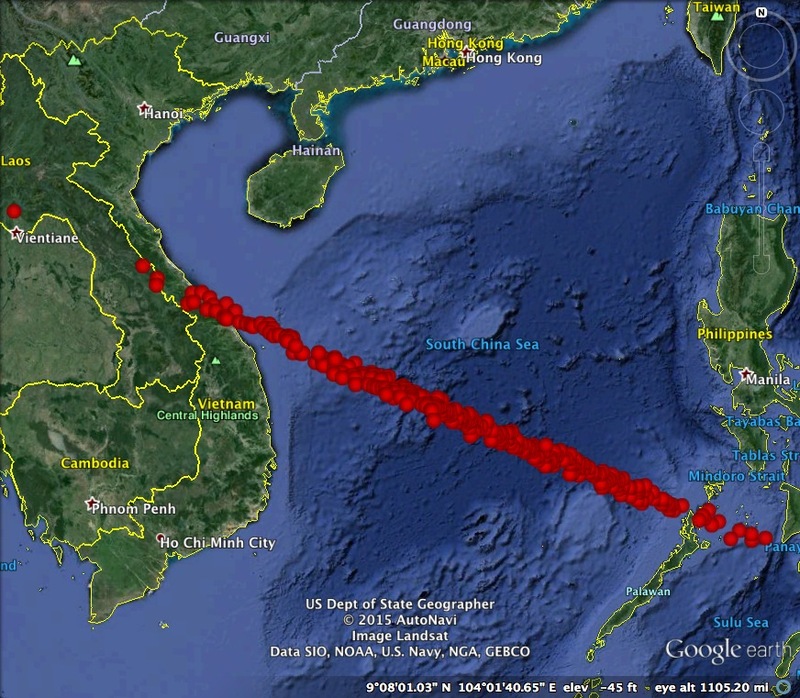 The potential impact location is now almost entirely constrained to the South China Sea. Unless it is deflected, the asteroid will impact somewhere within this region. 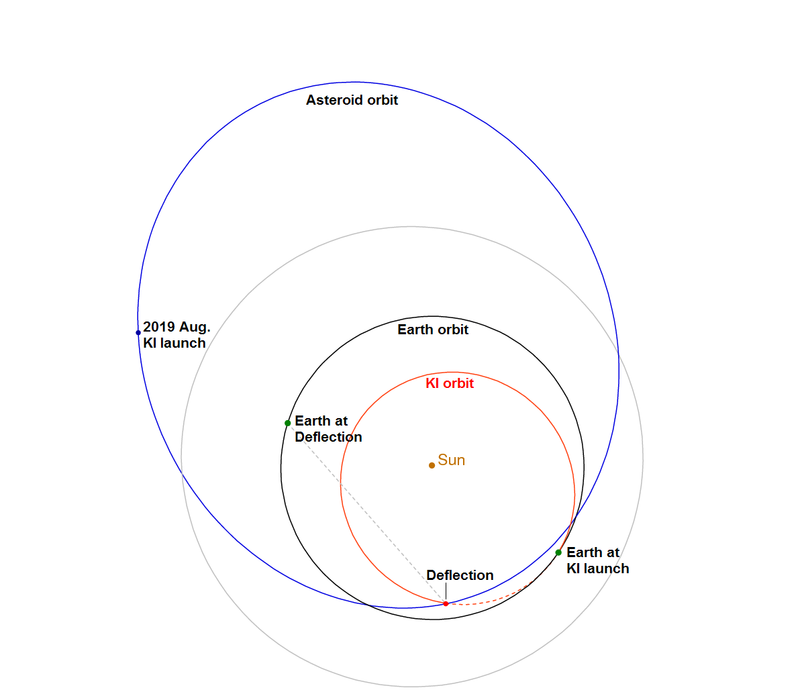 This diagram shows the trajectory followed by all of the six Kinetic Impactor (KI) deflection missions (in red), along with the orbits of the asteroid (blue) and the Earth (black). The launches occur during the 10-day period from Aug. 12 through Aug. 22. The Kinetic Impactors arrive at the asteroid and deliver their respective deflections during the 7-day period from Feb. 28, 2020 through Mar. 6, 2020. The asteroid will be only 30 degrees from the Sun at the time of deflection. Asteroid 2015 PDC has not been observed for the last three months, due to unfavorable geometry. In fact, the asteroid is almost directly on the opposite side of the Sun during the launch period. The unfavorable geometry unfortunately continues over the entire 200-day cruise period of the interceptor spacecraft. Even at the time of deflection, the asteroid will still only be about 30 degrees from the Sun, which will make ground-based optical observation of the event very difficult. The deflection occurs very near the asteroid’s perihelion point, which is generally the most effective part of the orbit for an impulsive deflection. The asteroid will be moving faster in its orbit about the Sun than the interceptor spacecraft are moving in theirs. Although it may seem that the spacecraft run into the asteroid from behind, in reality the asteroid runs over the spacecraft. The net effect is that asteroid slows down slightly in its orbit about the Sun. The KI interceptors will strike the asteroid at a closing velocity of 15 km/s (9 miles/s). Each will transfer all of its momentum to the asteroid, possibly augmented by additional momentum from ejecta. A total of about 20 mm/s of velocity change is required to move the asteroid off of an Earth-impact trajectory. That velocity change would shorten the asteroid’s orbital period by only 5 minutes or so. The unfavorable observing geometry for 2015 PDC will continue for another 3 months, until November 2020. But it will take many more months, possibly even a full year, to accurately determine the velocity change delivered to the asteroid and confirm that the asteroid is no longer on an impact trajectory.